Landscape Lights and Lanterns in San Francisco is a bit specialized. What works in the South Bay may be a complete failure in the city. The 49 square miles that we call home is often shrouded in fog and laiden with moisture and salt, wreaking havoc on poorly selected landscape lighting fixtures. Tamate Landscaping only uses high end copper and brass or stone fixtures that have proven to resist the elements. Yes, the initial costs will far exceed the price of something available at Home Depot but you will reap the benefits in a system that last exponentially longer. In addition, we select fixtures that accentuate the overall design of our projects. Here you see a Miyoshi lantern. It can be illuminated and is available 30″, 36″, 48″ and 60″ versions. Also available in a rustic finish version. Below is one of our favorite and most used fixtures. Made by FX Luminaire, its the Saguaro Petite. Elegant, simple and of all copper/brass construction. 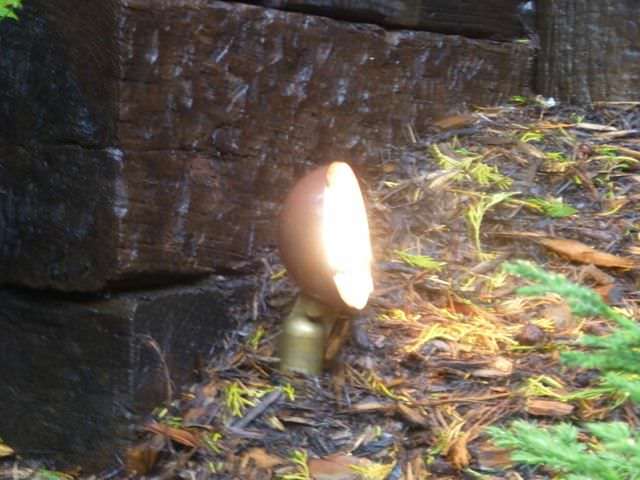 Its used to illuminate pathways, patios and other landscape elements that are low to the ground by casting a 24″ soft, glare free light on the ground. Comes with a 20 watt bulb but can be retrofitted to use a LED bulb. 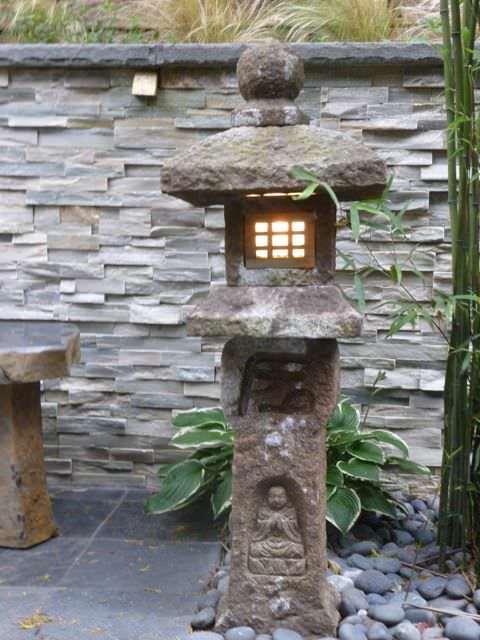 This fine stone lantern is a staple of the Japanese garden. Its the Yukimi Lantern. Made of solid granite and comes in 18″, 24″, 30″ and 36″. Tamate landscape often uses this piece to complement their designs. FX Luminaires new PO series. This little fixture is LED, solid brass and highly efficient at 2.4 watts. 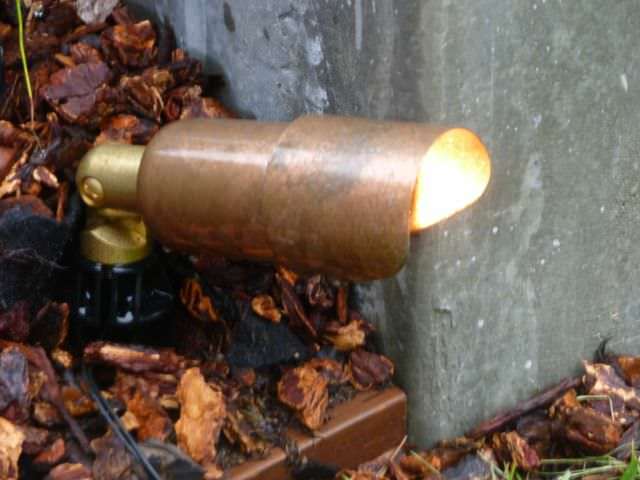 Its used to provide a “wall wash” effect for retaining walls or you could even mount it on a 4×4 post. Working with water features in San Francisco over the last decade and experimenting with different fixtures to illuminate the underwater environment has been somewhat of a challenge. We’ve tried many different companies to find quality fixtures while keeping in mind that the average consumer doesn’t want to spend in excess of $500 for one fixture only. Most have failed or lasted only a few years until moisture slowly finds its way into the housing. Below is an underwater light from Kitchler. Its a 4.25 watt LED and fully encased in epoxy within a stainless steel housing which makes the possibility of leaks impossible. And Kitchler backs that up with a 15 years warranty. Listing at $170, its not exactly cheap but the way to go in the long run. 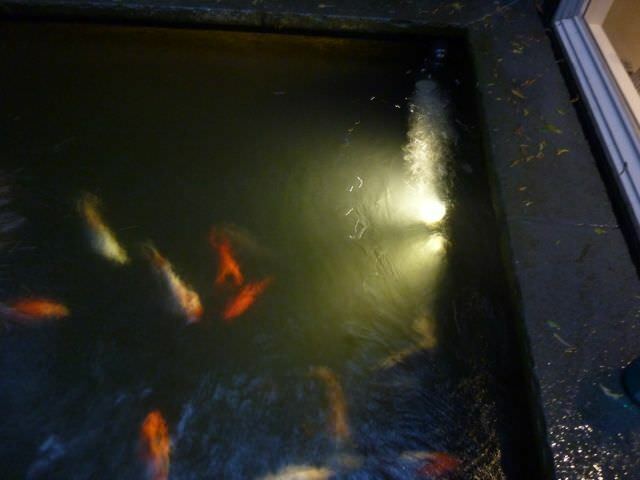 Below is a photo of the Kitchler, model 15711 SS and also 3 in one of our koi ponds. 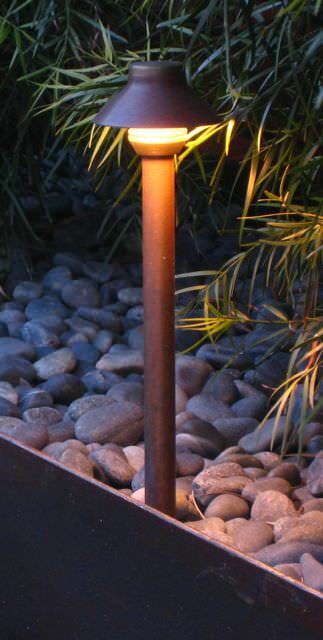 This is the Oribe lantern in a rustic finish. Its a lantern that was designed by Lord Oribe, a tea ceremony practitioner in the 16th century. It has a light box at the top and a carved buddha on the bottom. Available in 30″, 36″ and 48″ in rustic as well as new grey granite. Next is the FX RotundaLuna®. 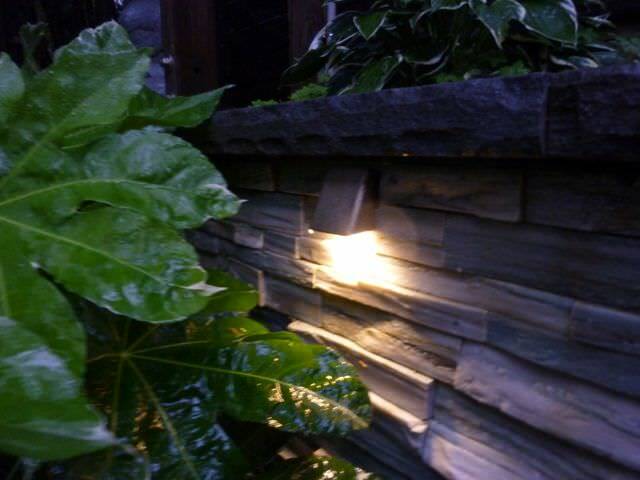 Its specifically designed to gently illuminate small scale plant material, boulders, and short garden walls. Halogen lamp model produces a white light that enhances green plant material. The xenon lamp has a mellow golden light output for enriching earth tone elements. Another staple landscape lighting fixture, The FX Luminaire LustroRame.The LustroRame provides a source of subtle light from a flawless luminaire. This solid copper and brass unit is an excellent choice for shadowing or backlighting small plant material or garden sculptures on upscale residential or small commercial projects. The MR-16 halogen lamp based LustroRame produces a powerful crisp light that enhances plant material and larger scale landscape elements. 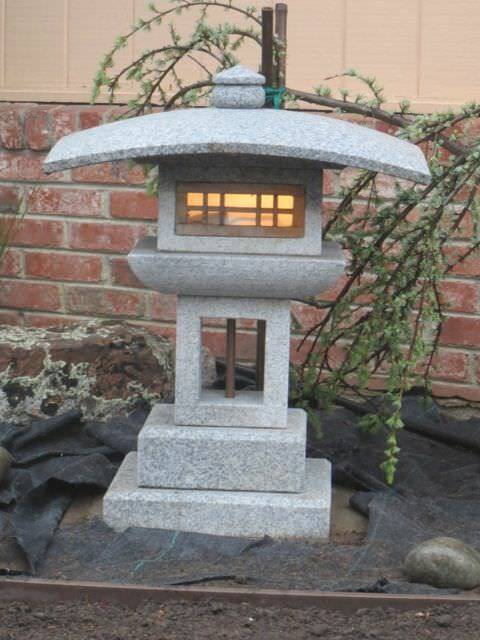 Pictured below is the all granite Kanjuji Lantern. 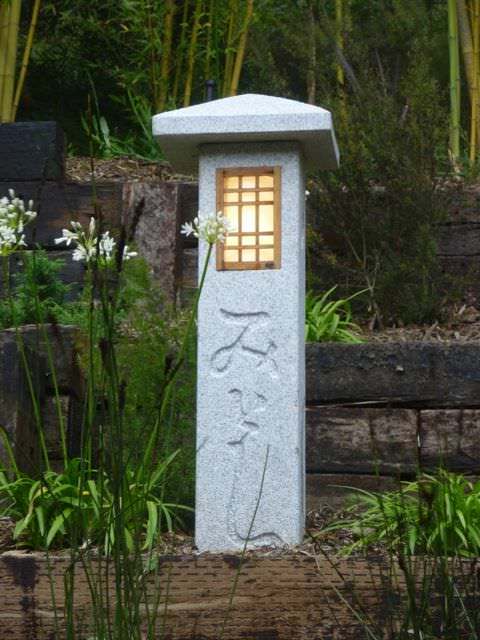 The Japanese Kanjuji lantern offers clean lines with a east-west blend of garden styling. 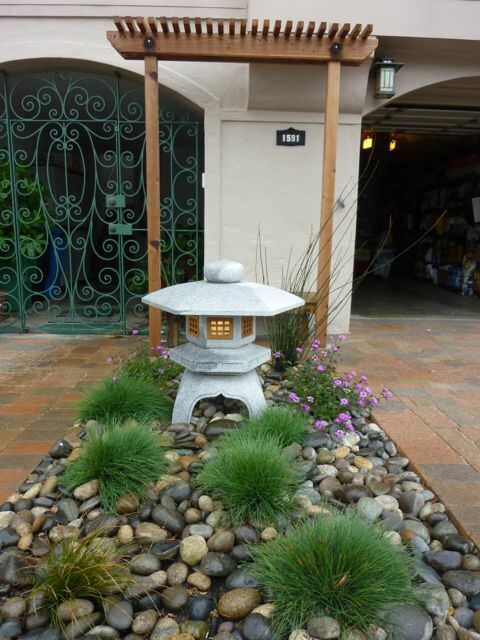 The Kanjuji lantern can add a Zen feeling to a garden around a western building. Its perfect also for a contemporary asian garden. 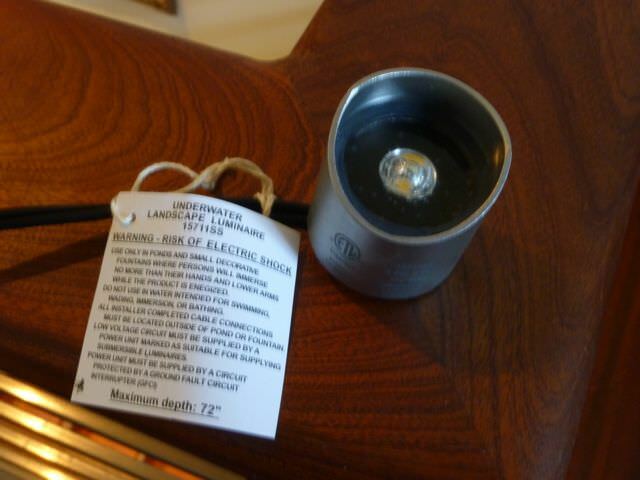 Pictured below is a 24″ tall version with a low voltage light hooked up to a timer.